And there you have two disparate opinions on Feral’s Dank Blanc. To be fair, they're as much a comment on the Brut IPA style as the technical wizardry on display in brewer Will Irving’s Dank Blanc. So, before we get to the beer at hand, a little context... This is not a dry, hoppy lager but it does use a very similar malt base to Feral's Perth Local (a lager) before ably distinguishing itself from its more knockabout peer by featuring more hops than even War Hog American IPA, then finishing with a final gravity of 0.098; you can't make a beer much drier – we're into gueuze territory here, folks! Nelson Sauvin, Citra and Amarillo hops are joined by Mosaic lupulin pellets to create gooseberry, tropical fruit and citrus aromas, while Will reckons the New Zealand Nelson Sauvin hops also throw off a hint of diesel. Similar flavours appear on tasting, where there's an undercurrent of ruby grapefruit. Dank Blanc's resiny dankness presents less as a sticky forest floor, instead contributing to mouthfeel where, with little body to speak of, it’s the beer's hop oil texture and the 6.5 percent ABV booze that fill out the pale straw-coloured beer. This is complemented by a higher volume of CO2 than is typically found in an IPA, delivering a suitably fine carbonation that exacerbates the dry finish on the palate. At first blush, Dank Blanc may appear simple; however, there is precision, technique and, perhaps, a new way of viewing hoppy beers at play here. Whatever the case, for many Dank Blanc will indeed prove incredibly drinkable and perfect for summer. 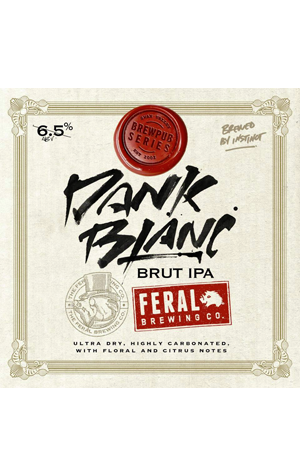 Dank Blanc is also available from the Swan Valley brewpub. If they've not redeemed the offer yet, Crafty Cabal members can enjoy a free growler AND fill from the brewpub too.